Initially when I was thinking about Valentine's Day, I didn't really think I thought too much it, of the holiday, but as I started to think about past Valentine's Days I've had, I realized that me and cupid of sort of a sordid past. -There were plenty of Valentine's Days where I didn't have a Valentine, and as I'm sure you know, those sucked in highschool. Everyone walked around with their flowers, and balloons and it made me sick lol. -Most of the time my whole crew was solo on Valentine's Day. One Valentine's Day we decided we would watch a movie at my friend Brittany's house to celebrate. We watched some M. Knight Shyamalan movie, I can't remember which one, I *think* it was Signs. I recall us jumping at the ONE scary moment in the whole movie. -There was the Valentine's Day where my Valentine gave me a dusty teddy bear, that came with chocolates, and the chocolates were spoiled. He had obviously pulled it off some shelf in his house from God knows how many Valentine's Days before that one. -There was the Valentine's Day where my boyfriend at the time did not call me the whole day, and didn't answer my calls. When I talked to him the next day, he said he didn't have any money. I explained to him that even if he didn't have any money (which was fine, we were in highschool, who was ballin' back then? lol) he could have CALLED ME, HIS GIRLFRIEND to say Happy Valentine's Day. -There was the Valentine's Day where I shared a Valentine with another girl who was obviously "battling" me over this particular boy we both liked. I'm not sure, but I think as we've gotten older he's come out as homosexual...which is totally fine, just makes that Valentine year even funnier. -There was a long distance Valentine's Day my first year of college where my Valentine mailed me the cutest little puppy dog stuffed animal, and I sent him a Valentine's Day collage of myself. -There was the Valentine's day where I took my boyfriend who's now my husband to see Chris Rock live, which was an awesome time. Valentine's Day is certainly eventful! I can think of 3 memorable Valentine's Day. I gave a V-Day card to the guy I was dating (though, we weren't quite official). It was just a little card I made on the computer but he got a little upset because he didn't think to get me anything (and I was fine with that). Two V-Day ago my boyfriend at the time went ALL out. Roses, a dinner and a movie. Then last year The Ex made me homemade fudge and I made him cookies and sent them to each other (since we were living apart). This year once again I'm in a LDR and the subject hasn't come up and I'm definitely not expecting anything. 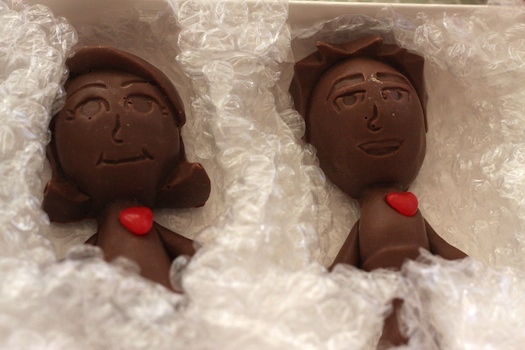 I found your blog on 20-something bloggers :) I love this post and those little chocolate people are too adorable, you don't want to eat them haha.